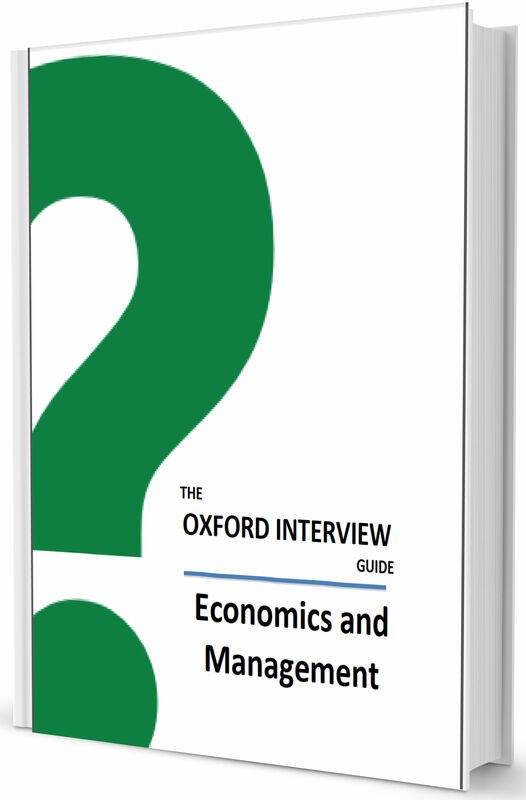 The Economics and Management guide discusses Oxford Interview Questions in depth with answers and approaches – along with possible points of discussion to further demonstrate your knowledge. The Economics and Management Guide also includes the Oxford General Interview Guide. It has been specially edited for applicants for each subject by a team of Oxford and Cambridge graduates. The Oxford Economics and Management Interview Guide is available to download now! Can we really measure GDP? Should governments intervene in the market? What is the best way to win in the game of Monopoly? Is this possible in real life? By understanding how the interview works and, crucially, what it is that the interviewer is looking for. The interviewer is not looking to catch you out, but rather for you to demonstrate your curiosity, knowledge and passion for Economics and Management. The easiest way to demonstrate your enthusiasm for Economics and Management is to show that you are self-motivated and have studied the subject in your free-time for enjoyment – for example through online lectures and independent reading. If you don’t know where to start, review our suggested reading list below. If there were three beautiful, naked men or women standing in front of you, which one would you pick? Does this have any relevance to economics? Can you put a monetary value on this teapot? What is the point of using NHS money to keep old people alive? Explain why teachers might be changing jobs to become plumbers. What is the difference between buying and selling of slaves and the buying and selling of football players? How would you market a pub rock band? What are the consequences of changing interest rates? What is a monopoly? What are the advantages and disadvantages? Summarise Economics in one word. What’s the difference between a correlation and a cause and effect relationship? Why is Dubai expanding so rapidly given that it has no tax generated income? Compare and contrast the Indian and Chinese economy. Do economists rely too heavily on models? How would you calculate the return on investment for NASAs operations? How would you calculate the return on investment of Christopher Columbus’s voyages? How can we predict future economic recessions and avoid depressions? If a petrol station on a road is equal distant from two towns, where should the next petrol station be built? If you and a business owner each have 10 loyal customers who will always buy from you unless you sell above £10, and there are an additional 80 who will choose who to buy from based on price alone, at what price does it become more profitable to stop undercutting your competitor and sell at £10 instead? Imagine you have just opened up a new airline that flies a unique route. How would you determine what price to set tickets at to ensure maximum profit? Is outsourcing a good thing? Is sociology useful for studying economics? Should government intervene in the market? Should governments have debts? What measures would you suggest to eliminate the national debt? Should inequality matter to economists? Should we still be giving aid to countries that have international space programmes e.g. India? Tell me about some philosophical works you’ve read. The value of the US Dollar and Japanese Yen are swapped with each other overnight. What would happen to global markets? The value of the US Dollar and Japanese Yen are swapped with other overnight What would happen to global markets? This graph shows salt prices for the last 200 years. They follow a very predictable and cyclical pattern. Given that there was a huge depression and two world wars, how is this possible? Was the financial crisis of 2008 a failure of regulation? What is Gambler’s Ruin and what does it tell us about how a casino operates? What would be the implications of Scotland leaving the UK? What about Wales? Would I be justified in saying that only morons play sport? What would you say if Gordon Brown were to take a report which shows that people who go to university earn more than those who do not, and then proclaim that going to university causes you to earn more? Why is a film actor wealthier than a theatre actor? I give you £100. You have to offer part of this £100 to someone. Unless they accept the offer, you get nothing. How much will you offer? Why is deflation a scare to the UK? Would you support the privatisation of the NHS? A girl in a small town wishes to sell a painting – will she earn more revenue through sealed bids or raffle tickets? What two simple things could you recommend to a shopkeeper to increase their sales? What causes some brands to go global whilst others to fail? What drives immigration and emigration? What influences a country’s productive potential? What is point of the G5? What about the G20? What is the difference between capitalism and communism? Are they really that different? What is the best way to win in monopoly? Is this possible in real life? What is the biggest problem facing CEOs? What is the difference between a firm and a company? What is the difference between the Chancellor of the Exchequer and the Governor of the Bank of England? What is the golden ratio? Why do banks and investments firms obsess over it? What were the causes of the American depression in the early 20th century? What will happen to oil prices in the next 10 years? What about 100 years? What would happen if there was no inflation? Why do teachers become plumbers and who should pay for their training? Why are branches of Starbucks and McDonalds so close to each other in cities like London, Tokyo and New York? Why are diamonds so expensive and why is steel so cheap? Why are diamonds so expensive? Why is steel so cheap? Why are we privatising large services like Royal Mail and the NHS? Why does the Bank of England fear deflation? What would happen if there was no inflation? Why don’t we use Euros? Why is the American economy so strong? Would an economy based entirely on the tertiary sector be feasible? You are the captain of a pirate ship and have found a treasure chest. Your crew gets to vote on how the treasure is shared. If fewer than half of the pirates agree with you, you die. How would you share the gold in such a way that you get a maximum share and survive?